The XTENDEX?Serial IP extender transparently connects, configures, and communicates with serial devices over Ethernet using a single IP address. Available in 1, 2 and 4 port versions. 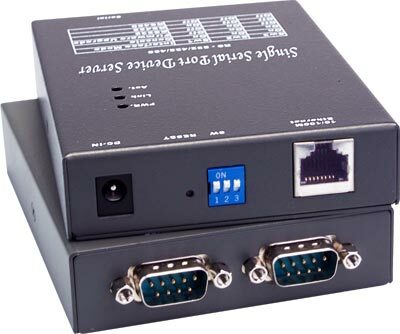 Each model uses DB9 male serial connectors and supports RS-232, RS-422 and RS-485. Network enable any RS-232/422/485 serial device for remote access and control. Virtual COM drivers for Windows 98/ME/2000/NT/XP. Supports Web and Telnet consoles. Built-in Web Server allows you to manage the SERIAL-IP-4 from a web browser anywhere on the LAN/WAN. Remotely manage SERIAL-IP-4 and your serial device. Software Configurable – Control functionality remotely. Monitor Port – Use any PC on the LAN/WAN to actively view and troubleshoot the communications status. Shows when there is a client connection to the server. Serial transmit and receive byte counter. Displays RTS/DTR - DCD/DSR/CTS status. Connect the SERIAL-IP-x to a NTI Serial Console Switch to remotely control up to 32 RS232 devices. Serial port connector: male DB9. LAN: 10.100 Mbps Auto-detecting-10 BaseT, 100 BaseTX. RS232: TX, RX, RTS, CTS, DTR, DSR, DCD, GND. RS422: TX+, TX-, RX+, RX-, RTS+, RTS-, CTS+, CTS-, GND. RS485: Data +, Data –. Data rate: 110 bps to 230.4 kbps. Protocols: TCP, IP, ARP, DHCP, Telnet, HTTP, UDP, ICMP. Client software: Virtual COM port driver, manager software. Communication mode: Virtual COM port mode, direct IP mode, paired mode. Power: 110 VAC at 60 Hz via AC adapter. Regulatory Approvals: FCC, CE, RoHS.